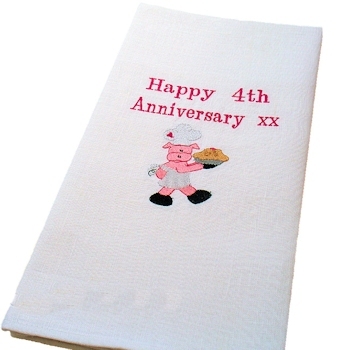 Personalised tea towel with a cute chef pig and your choice of name little message or initials mongrammed to make a truly special gift. Personalised tea towel with a cute chef pig and your choice of name little message or initials mongrammed to make a truly special gift. Unique and useful gift idea for men, women and suitable for any occasion or holiday! Choose the Text. Personalised tea towel with a cute chef pig and your choice of name little message or initials mongrammed to make a truly special gift. Unique and useful gift idea for men, women and suitable for any occasion or holiday! Choose the Text. Choose the thread Colour.